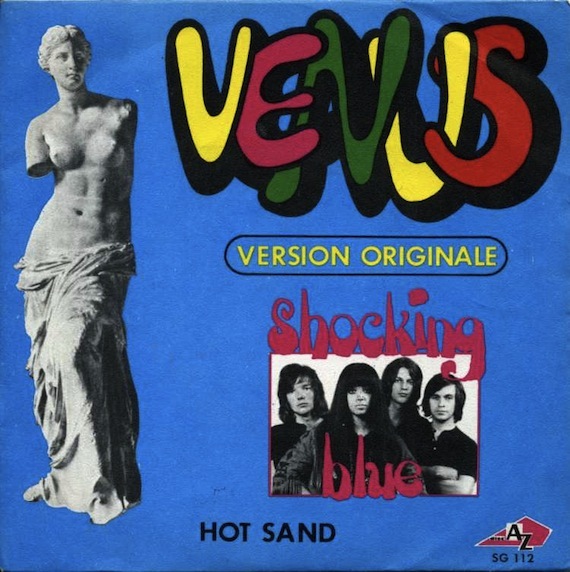 Come for the ear candy that is “Venus“—stick around for the pop trash goodness of “Hot Sand.” (Is that a sitar I hear? Yes, yes it is). Culled from a 7″ vinyl rip of early 70s Dutch rock weirdos, Shocking Blue. dunno if it’s the same in the states but the song Venus (different version) is used in a god awful razor advert over here in the UK and is now unfortunately forever tarnished for me! I haven’t heard Hot Sand since I found my mother’s magic box of 45’s in my grandparents basement. The Everly Bros., Little Eva, The Kinks “Victoria”, Johnny Horton, Bob Seger System. A very special day indeed. Thanks for helping me remember! these guys also did the original version of “Love Buzz” – which i am guessing the majority of this sites readers know from Nirvana’s first record. I just scored this one at my local Salvation Army a few days before this post. Great record…What a find!!!!! The song has a familiar riff to it. Definitely better than I envsioned. If I see it in a thrift store, i’ll pick it up. Thanks for posting it.